A Shuttle staffer has drawn our attention to an interview in the UK Sunday Express with Simon Napier-Bell published in February. The same staff member introduced our team to Simon when he visited Sydney in 2007 for a series of radio and TV interviews. It seems the bon viveur, pop impresario and songwriter and lately, best-selling author has verbally seduced another journalist over a fine dinner. Our colleague reckons that is Napier-Bell's stock in trade and it works extremely well. He dazzles and hypnotizes over the dinner table with words and a fine bottle of vintage red. Simon's website is a must to visit and full of anecdotes and the history of his musical successes from the Yardbyrds, Dusty Springfield, Marc Bolan and T-Rex to Wham with a few of the biggest chart topping songs penned along the way. 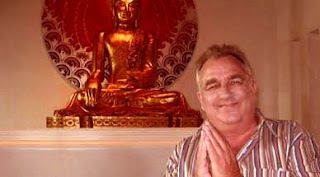 He lives most of his time in Thailand now and is writing another book-the last 3 having been best-sellers with 'Black Vinyl White Powder' regarded by critics as possibly one of the best books ever written on the music industry. 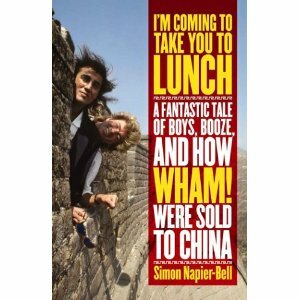 I recommend "I'm Coming To Take You To Lunch" about Napier-Bell's successful scheme to get Wham to be the first western band to ever appear in China. At times it reads like a thriller and is one of those books you find difficult to put down. 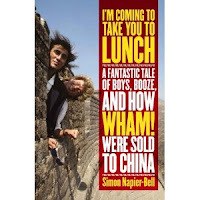 Our Shuttler says he went on a few adventures with Mr Napier-Bell to foreign parts and has some very saucy tales to tell but is keeping them for his own tome. He did let us in on one episode though when the pair visited Rome for a weekend. Being our Shuttlers first and only ever visit to the glorious city, the 2 set out for a stroll along the beautiful Villa Borghese gardens on a perfect Roman spring day. Within minutes they spotted an extremely handsome young Italian stud who sent all the right gaydar signals. Our Shuttler wheeled around and insisted upon following the young Italian. He says it was like a scene out of Death in Venice - the young man would stop occasionally to allow them to gain traction and then speed off again. All that was missing was the black hair dye running down our Shuttler's face in the heat. In a two hour trek at lightening speed our Shuttler whisked past sights he had dreamed of one day visiting, seen only out of the corner of his eye in a blur. Down the Spanish Steps, along the Via Veneto, past the Trevi Fountain, the Vatican City, the Coliseum and so on. Ten yards behind Mr Napier-Bell did his best to keep up pleading for a cultural interlude but ignored. On a hill high above Rome with our Shuttle staffer believing success was soon to be his and his own Roman Spring of Mrs Stone was about to blossom, the young Italian turned around, laughed, gave a sporty wave and sped off to disappear forever into a labyrinth of alleyways. He remembers little of Rome from that weekend except a later visit to a disco to drown his sorrows whereupon he rounded on Napier-Bell and accused him of wrecking what was destined to be a romantic love tryst, by lagging so far behind. In a huff he walked off in high dungeon and out the door to return to their hotel - and straight into a broom closet. Where he waited a full hour before he emerged in embarrassment. Ever the perfect host, Mr Napier-Bell was patiently waiting with a fine bottle of white wine on ice. Years later our Shuttler was dining with mutual acquaintances who had recently met with Mr Napier Bell in Singapore and they commented on how entertaining he had been. Which included recounting the tale of the race through Rome !